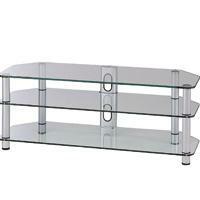 Hamilex TV Stand EV upto 60" Television Stand. contemporary design. Simplicity is the key with this classic open rack style glass and metal pipe.